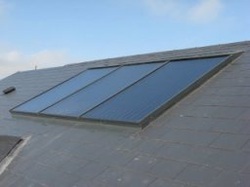 Clean Energy Ireland supplies four separate flashing kits for the following roof finish types. - Irregular Tile with lead skirting (Dark brown). No additional lead, sealants or fixings are required. The pump station comes in either Return string or combined Flow & Return. 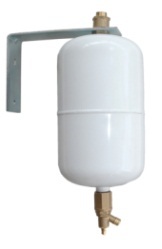 Each station has an easy fit mounting bracket as well as an expansion vessel stainless hose mounting bracket and isolating valve. The Pressure Valve (PRV) is rated at 6 bar, it conforms to DN4757 part 1, certified to TÜV Solar and complies to Directive PED 97/23/CEE. The solar expansion vessel supplied with the Clean Energy Ireland Solar Heating Systems complies with DIN 4757 and is available in increments between 12 liters and 105 liters. 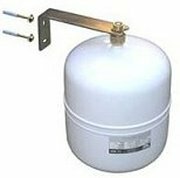 The vessel is pre-charged to 2.5bar and has a max working pressure of 10bar. For accurately calculating the correct vessel size there is downloadable software available from the Clean Energy Ireland website which is from DIN 4807. A brass drain is fitted to the bases of the SDV. Clean Energy Ireland supplies two types of solar controllers, Resol Deltasol Bs Pro and the Prozeda Controller. The Resol Deltasol BS Pro accepts 4 X PT1000 inputs and provides 2 X output relays. The functions in this controller allows auxiliary heating functions which could be used where there is a risk of Legionnaires. 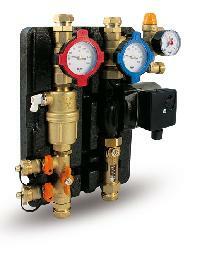 It controls east-west collector configurations and facilitates priority heating of cylinder zones. Stainless Steel is the preferred pipe used with solar installations. The pipe is manufactured from 316L grade stainless, allows rapid installation while italso prevents frequent joining of pipes. The following is the Area & Volume details of the solar pipe. HT Armaflex is the preferred solar insulation; this insulation comes in a range of sizes to satisfy Part L building requirements. The insulation is UV and water resistant and can tolerate temperatures of up to 150 degrees C. The following are technical details on the HT Armaflex. Tyfocor L is the preferred anti-freeze in solar systems. Tyfocor L is a non-toxic, virtually odourless, hygroscopic liquid. It is based on propylene glycol which poses no hazard to health and which may be used as a coolant or heat-transfer fluid in food processing and water purification applications. The corrosion inhibitors contained in Tyfocor L reliably protect the metals normally used in solar installations and other heating equipment against corrosion, ageing and deposits over long periods. Tyfocor L prevents the surfaces of heat exchangers from becoming fouled, and ensures consistently high thermal efficiency. The following files should be referred to before using this anti-freeze. The concentrate should be mixed to give a freezing point of -30 degrees C.